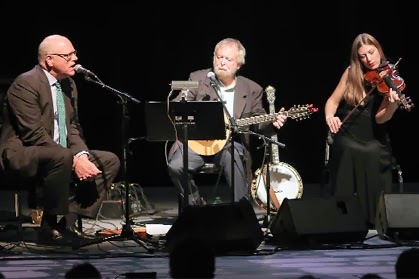 Lying just over two miles to the north of its Hell’s Kitchen domain, Symphony Space offered a most simpatico alternative for a special night for the Irish Arts Center’s benefit performance of An Irish Christmas. In his opening remarks to a near capacity crowd of over 700 people, many who were the center’s most loyal and generous patrons last Sunday night, executive director Aidan Connolly aptly described Symphony Space as a “home away from home” where they have successfully performed a number of productions in tandem with Dr. Mick Moloney in recent years. One of which is the increasingly popular An Irish Christmas: A Musical Solstice Celebration series that runs from December 6-21 this year in the Donaghy Theater that sells out its limited 99 seat space for most of the shows. The theater definitely puts you up close and personal with the artists and, for the purpose of this show, enhances the feeling of being at an Irish house party. However, I must say that the move for one night up to Symphony Space didn’t take away from the annual spectacle at all and, in fact, gave it a little more room to breathe on stage. In the six years that Moloney has produced the show, he has refined it to a high degree of creativity and efficiency, making sure that the sum of the parts entailed each night provides the right balance of entertainment the theater goers seek in a holiday show. The secret is building a great core of musicians that he can count on to provide just what he needs on stage with enough flexibility and experience to experiment when necessary and to buttress the talents of guest artists who are added to the program each year. That teamwork provided by Athena Tergis, Billy McComiskey, Liz Hanley and pianists Brendan Dolan and for the past two years, Donna Long along with dancer Niall O’Leary is the glue that makes this show tick time after time. This is matched by the teamwork employed by the Irish Arts Center staff as well who do everything possible to make it a very enjoyable experience for the artists and the audiences who are paying the freight and supporting the center’s mission to provide quality and innovative programming. All those noble attributes aside, it wouldn’t mean that much if the show wasn’t able to stand on its own entertainment value, and that was in evidence all Sunday evening in Symphony Space. Moloney and company create a mystique on stage that has one wondering what will come next (even if you have seen previous editions of the show like I have and many other devotees). This was demonstrated, oddly enough, by a silence in the hall (rather than the buzz or hum you often hear at a riveting show) as “Professor” Moloney wove his magical spell with his dexterous introductions of the acts and the history and personalities that defined them. One wonders how one man knows so much and can so easily recall it all evening, but he has been an outstanding fount of knowledge ever since he arrived on these shores four decades ago. Even more amazing is Moloney’s insatiable curiosity for learning new things or drawing out information from subjects on stage which is another key ingredient to the success of this Christmas show series. The special interviewee on Sunday was Congressman Joe Crowley of Queens, who shared his love of politics and Irish music from an early age before displaying his own fine singing voice, performing “The Dawning of the Day” or “Raglan Road” as it also known. Actor Gabriel Byrne, a long-time supporter of the center and a former cultural ambassador for his native Ireland, sat for some questions before sharing some of his work in progress on his memoirs in readings that gave us a greater insight to the artist who gives as much as he gets from his craft. There are probably some who might relish more familiar Christmas carols (Irish or English) as part of this presentation, but those can be found in other seasonal shows as this one chooses to plow a more universal path. So as in the prior two years, Filipino artist Grace Nono gives us chants from an ancient indigenous region of the Philippines, and songstress Tamar Korn equally fetching in the jazz idiom or Yiddish. They both in multicultural fashion exhibit the fun of having variety in the vein of “party pieces” at an Irish Christmas gathering. Recitations are also fondly remembered as party pieces, and MacDara Vallely gave a beautiful rendering of poet Patrick Kavanagh’s “A Childhood Christmas” in most dramatic fashion. We were also treated to some new songs from the versatile Liz Hanley from Boston, who has collaborated with Moloney for a number of years through the Washington Square Harp and Shamrock Orchestra and other shows. “The Carol of the Birds” and a chilling song about Jack Frost that the Watersons recorded were new to these ears. And Hanley’s fiddle work in tandem with Athena Tergis all night gave added depth to the lively Irish dance tunes. Tergis’ composition, “Lullaby for Haiti,” where she and her family have gone for a number of years to be among the disadvantaged people there, was tastefully matched with the Irish tune “Planxty Loftus Jones” made popular by the Irish Tradition, a trail-blazing band that Billy McComiskey formed in the Washington, D.C. area almost 40 years ago. Of special note and a delight to the audience were the dance moves that Niall O’Leary and Wayne Daniels (from British Guyana) exhibited in the show. The added acreage on stage gave more room for O’Leary’s percussive Irish stepdancing and, in particular, his Brush dance routine. Daniels was discovered as part of the exploration of Moloney and another academic dance historian and performer, Lennie Sloan, in their joint field work on the connections between the Irish and black communities in this country. He performed a dance routine to “Silent Night” and other choreography from his own fusion of influences in his own dance career. Their syncopated footwork and handwork of O’Leary and Daniels in tandem towards the end brought instant applause. It was another masterful performance that elicited a standing ovation as the show drew to a close and left many who will likely return again next year adding this show to their own holiday traditions. There are four more performances of An Irish Christmas at the Irish Arts Center this weekend (www.irishartscenter.org) from Thursday to Saturday but they are virtually sold out. Perhaps seats will emerge somehow so check their box office. If you can’t make it to a live show there are two excellent opportunities to catch the spirit and magic of the show. The Sunday night Symphony Space performance was recorded for airing on WFUV (available on www.wfuv.org) this weekend on Saturday from 10 a.m. to noon as part of A Thousand Welcomes hosted by Kathleen Biggins, and on Sunday afternoon from 2-4 p.m. for the last half of Ceol na nGael on 90.7 FM. Or you can order the live CD recorded from the show two years ago from the center. The money raised at the Sunday night fundraiser will be added to the significant amount already amassed by the Irish Arts Center in its soon to be realized quest for a new home in the rapidly developing Clinton neighborhood in Manhattan. They are two-thirds of the way towards the $50 million project which they hope will get underway this time next year according to Connolly, and finish in 2016. Exercise in outreach and the inspiration garnered from partners like Symphony Space will be invaluable as they build their new center and seek to establish a more permanent and viable operation to foster the continuing celebration of the Irish Arts in the Big Apple. Their first 40 years have had many remarkable achievements and contributions to Irish culture in New York City, but the best is yet to come.